Horseback riders travel towards Osage City along the Flint Hills Nature Trail. A long-term project to pave two miles of trail in Osage City for pedestrian and recreation use was thrown out at the June 28 meeting of the city council. 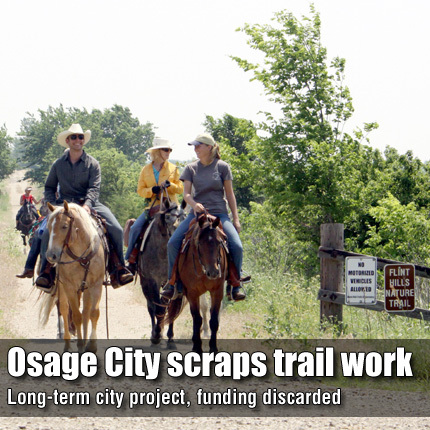 OSAGE CITY—Osage City’s planned rail-trail project has been abandoned along with taxpayer funds of $289,000 and Kansas Department of Transportation funds of about $1 million after a decision made by the city council last week. Osage City Manager Nick Hernandez said Osage City Council Member Duane Peroo had asked that discussion about the trail be put on the June 28 council agenda. Hernandez reported that plans for the project, which were contracted for design in 2006, are 99 percent complete. In 2005, KDOT designated transportation enhancement funds to pay for 80 percent of the construction costs of the project that would have built a concrete path from 17th Street west along an old Missouri Pacific rail bed. Hernandez said the city has spent $289,115.43 since the project’s beginning, including project development and design, and purchase of adjacent land. Hernandez noted in an agenda memo the trail project had been on hold without penalty from KDOT for the last eight months, while the city awaited a decision of whether state Highway 31 would be included in the state’s 10-year highway plan. About four years ago, KDOT contacted the city inquiring about why the project had not gone to bid; at that time, it was reported delays had been caused by survey and title issues. Hernandez said that in addition to construction of the trail, the city’s portion of the construction would include remedying drainage problems in the east part of the city. Costs to repair the drainage could be as much as $30,000 as a stand-alone project, Hernandez said. “If we do not go forward with the project, basically that $289,000 has just been for a set of plans and the project will never be completed,” Hernandez said. Although the council discussed the drainage issues near the Army Reserve building and the former Kan Build factory, no discussion was held on the city’s past expenditures for the trail project. His motion was immediately seconded by Osage City Council Member Leroy Stromgren. Council members Linda Carson, Ed Berends, Ed Mueller, Stromgren and Peroo voted in favor of the motion; Matt Brewer and Becky Brewer voted against. Council member Loren DeBaun was absent.